Baby Teething Pimples - Teething is one of the growing processes that every baby will pass. It is a condition when the teeth grow and appear in the gum surface. Actually, the teeth has grown up and developed when the baby is in womb, but it still inside the gum. After the baby is born, the teeth start to grow and pop up. Teething usually occurs between 3 and 7 months after baby is born. 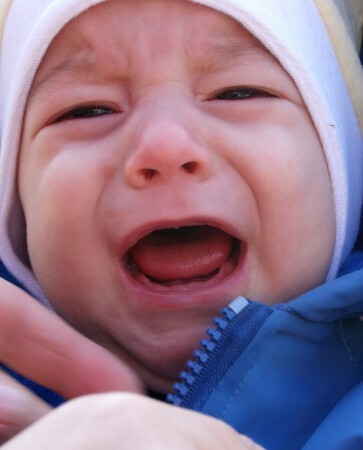 In the process of teething, there are some symptoms that can be seen. Drooling is one of the most common symptoms that can be seen in the process of teething. Drooling is a condition when baby issues much saliva. The saliva will come out from baby’s mouth. Commonly, it will make mouth area such as cheeks, chin, lips, hands, neck, and chest become wet. This condition will make some effects. One of the common effects that are caused by drooling is baby pimple. It is all called by baby teething pimples because the pimples come up in the process of teething. This condition is harmless, but it will look terrifying by some people, especially for moms. We are going to discuss briefly about baby teething pimples, the cause and also how to treat this condition. Pimples in the process of teething are mainly caused by the saliva that comes out when baby drools. The saliva can make some skin irritations and also produce pimples in a form of acnes and rash. Baby’s skin is very sensitive, so it easily gets irritated. It is possible that the saliva also brings dirt and bacteria that can cause skin infection. The skin infection can cause acnes. Commonly, pimples or acnes appear in the wet area where the saliva smears. The pimples will look like red bumps on the skin. The accumulated red bumps or pimples will also create rash. This condition will even get worse when the baby feel stressful because of the discomfort. The stressful condition will make the pimples need longer time to disappear. Also read articles about : Is Teething Rash a Myth or A Fact? Similar with other pimple, baby teething pimples don’t need any special treatment because the pimples will disappear automatically and naturally as the teething processes finish. However, there are some steps to prevent and treat baby teething pimples. First, you need to clean the saliva that comes out from baby’s mouth, by wiping gently with soft towel. There are some tissue products that are specially designed for baby’s skin. That kind of tissue can help to kill the bacteria on the skin. Second, you have to ensure everything is clean. It will prevent other bacteria to infect the skin and produces acnes. Don’t try to pinch or do something with the acnes without any recommendations from the doctors. You need to be patient enough until the acnes disappear naturally. Avoiding stressful condition for the baby also can be really helpful for not to make the pimples get worse. That’s all about baby teething pimples. Yes, pimples can be caused by the process of teething. Drooling becomes one of the biggest factor that cause baby teething pimples. Hopefully, this information can help to know better about baby teething pimples and how to handle it appropriately.